“When death comes, as it does to us all, life is changed, not ended,” the Rev. Russell Levenson Jr., rector of Bush’s Houston congregation, said during his state funeral sermon. “The way we live our lives, the decisions we make, the service we render matter. They matter to our fellow human beings, to this world that God has given us, and they matter to God. Few people had understood this as well or lived their lives as accordingly as President George Herbert Walker Bush. 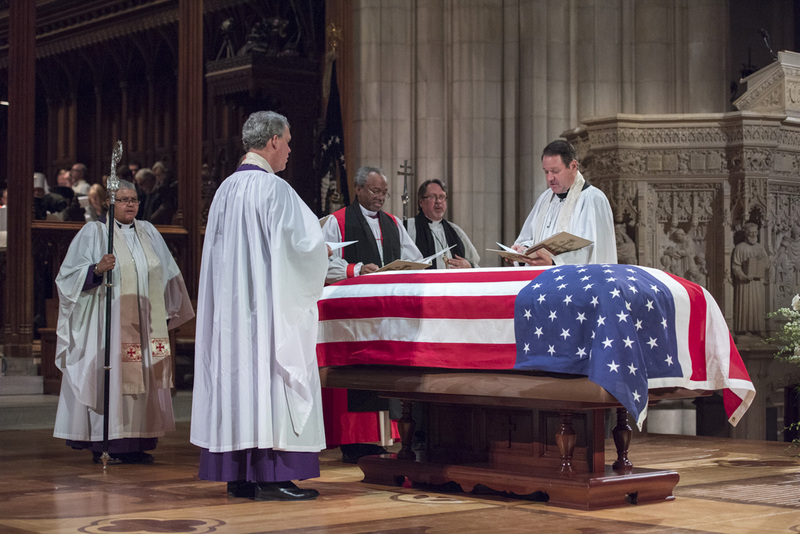 Recalling Barbara Bush’s frequent comment to him of “good sermon, too long,” Levenson preached for just more than 12 minutes during the service at Washington National Cathedral, which ran nearly two and a half hours. The service, which can be viewed here, drew a capacity, invitation-only crowd of nearly 3,000 people, including family members, all five living U.S. presidents, senators, representatives, Supreme Court justices, Trump administration officials, diplomats and foreign dignitaries, including German Chancellor Angela Merkel and Britain’s Prince Charles. It was the fourth presidential funeral held at the cathedral. The previous three state funerals at the cathedral were President Dwight Eisenhower in 1969, President Ronald Reagan in 2004 and President Gerald Ford in 2007. Bush gave eulogies at Reagan’s and Ford’s funerals at the cathedral. President Woodrow Wilson is entombed at the cathedral, but his 1924 burial service was not a state funeral. 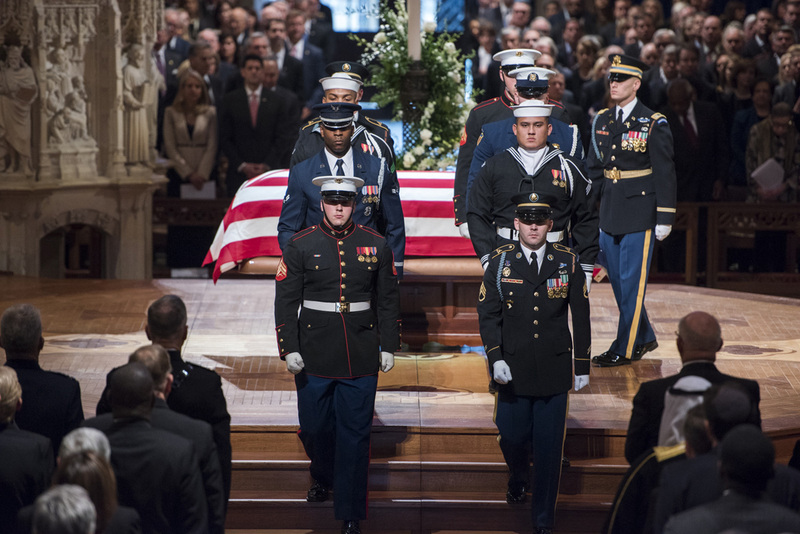 The last funeral at Washington National Cathedral to approach such significance was the service for U.S. Sen. John McCain on Sept. 1. But a state funeral is an honor reserved for presidents, part of the series of tributes coordinated by the U.S. Army Military District of Washington. 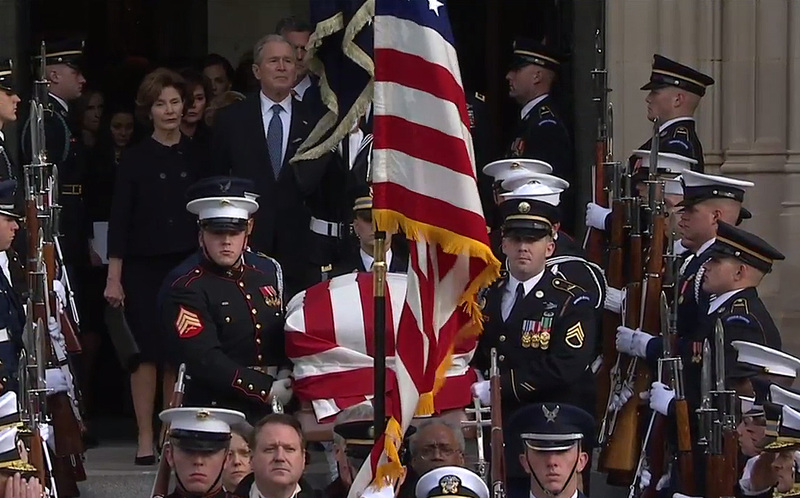 Bush’s casket arrived by hearse at the cathedral just before 11 a.m., accompanied by the Bush family. Presiding Bishop Michael Curry, Washington Bishop Mariann Budde, the cathedral’s Dean Randy Hollerith and Levenson, of St. Martin’s Episcopal Church in Houston, waited on the cathedral’s steps with the Rev. Rosemarie Logan Duncan, the cathedral’s canon for worship. The military pallbearers slowly and precisely carried the casket up the steps to where Curry and Budde recited the traditional “reception of the body” prayers. “With faith in Jesus Christ, we receive the body of our brother George for burial,” Curry said at the door. The Bush family was escorted into the church and, at the front pew, the president’s son, former President George W. Bush, greeted President Donald Trump and former Presidents Barack Obama, Bill Clinton and Jimmy Carter, and their wives, who sat together in the front pew across the aisle from the Bush family. Then, the cathedral’s bells began to toll 41 times to mark the elder Bush’s rank among U.S. presidents, as acolytes and clergy, including those from other faiths, slowly led the pallbearers carrying the casket up the cathedral’s long aisle. Hollerith and Levenson recited the anthems from the Book of Common Prayer’s Burial Office. The order of the service is here. 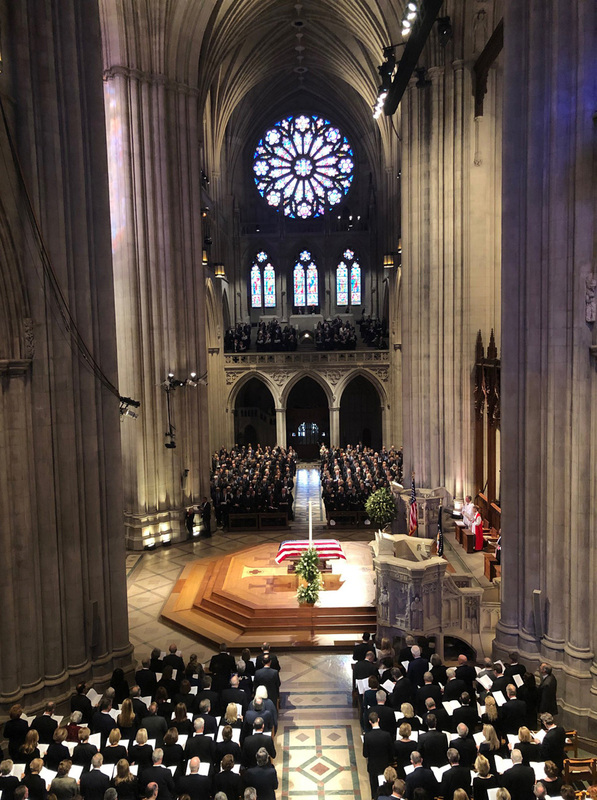 During the service, four eulogists, George W. Bush, former Canadian Prime Minister Brian Mulroney (whose term overlapped Bush’s), former U.S. Sen. Alan Simpson of Wyoming and Bush’s biographer Jon Meacham, remembered the elder Bush. Meacham began the tributes, telling the congregation that Bush was “an imperfect man” who “left us a more perfect union.” Bush, Meacham said, knew that politics could not be completely pure if you wanted to win, and you had to win if you wanted to lead. Meacham said Bush believed there was a reason he had been spared death during a World War II bombing raid in the Pacific, during which his crewmates died, and he spent the next 74 years of his life in service to that belief. Mulroney, standing at a podium very near Trump, praised Bush’s efforts to preserve and strengthen the North Atlantic Treaty Organization after the disintegration of the Soviet Union and the Iron Curtain. He also praised Bush’s work to achieve the original NAFTA agreement, which he said had been “modernized and improved by recent administrations.” Trump has been critical of both NATO and NAFTA and recently announced he would withdraw from the latter, apparently in an effort to force Congress to approve a new version of the trade pact with Canada and Mexico. During Simpson’s folksy and humorous eulogy, he recalled a time when he said he had fallen from Washington’s A list to what he called the Z list because of his political choices. Bush invited him and his wife to join the Bushes for a weekend. The four had a highly visible departure from the White House. Simpson remembered Bush saying his staff told him not to issue the invitation, but he overruled them, citing friendship over politics. Bush understood the choices that leaders had to make, the former senator said. Bush was once presented with a bipartisan bill on the budget process, health care, Social Security solvency and other policy issues. To fund the bill, taxes would have to be increased and that would require the president to go against his well-known promise of “Read my lips: No new taxes.” The bill passed in the Senate, but Bush’s fellow Republicans in the House defeated it and, Simpson suggested, Bush’s willingness to break his no-taxes vow for the sake of the bill led to his failure to be elected to a second term. Simpson said Bush told him that when faced with tough choices, he chose “the country that I fought for,” rather than his party or his legacy. “Those who travel the high road of humility in Washington, D.C., are not bothered by heavy traffic,” Simpson said. During his eulogy, George W. Bush said his father almost died of a staph infection during his teenage years. That and his World War II experience “made him cherish the gift of life, and he vowed to live every day to the fullest,” the 43rd president said of his father, the 41st. Bush said his father “taught us that public service is noble and necessary, that one can serve with integrity and hold true to the important values, like faith and family. Bush said he learned years later about how his parents’ faith sustained them when his sister, Robin, was dying of leukemia at age 3. “Dad always believed that one day he would hug his precious Robin again,” he said. During his sermon, Levenson said Bush’s life showed that “faith means more than words,” adding that Bush’s faith was “a deep faith, a generous faith, a simple faith in the best sense of the word. On the day Bush died at age 94, Levenson said the president’s friend James Baker stood at the foot of Bush’s bed, rubbing his feet for about 30 minutes, causing Bush to smile. Levenson said he had the sense of Jesus’ service on Maundy Thursday, washing his friends’ feet. Later, all those who were with Bush knelt and placed their hands on the president and prayed “and then we were silent for a full long measure as this man who changed all of our lives, who changed our nation, who changed our world, left this life for the next,” he said. The funeral then continued in the traditional structure of the Burial Office, and after Curry, Budde, Hollerith and Levenson performed the commendation, the military pomp began once again. The pallbearers moved into place and lifted Bush’s casket as the organ began to play the hymn “For all the saints.” The sharp sounds of military commands could be heard over the music as the clergy led the casket from the church. They waited alongside the hearse parked in front of the cathedral as the casket was loaded for the trip to Joint Base Andrews where Air Force One would take the Bush family home to Houston. The former president will lie in repose at St. Martin’s Episcopal Church until 6 a.m. Dec. 6. Another memorial service will be held at the church later that morning. Bush will then travel by train and then by motorcade to the George H.W. Bush Presidential Library in College Station, Texas, where he will be buried next to his wife, who died in April, and their daughter Robin. Episcopal News Service coverage of the funeral planning and Bush’s relationship with the Episcopal Church is here.